We live less than 15 minutes from our favorite lake. The problem is, it also happens to be everyone else’s favorite lake, which means in order to get a spot within the vicinity of actual water, you have to be there when the gates open at noon and participate in something similar to the Oklahoma Land Rush. It’s not uncommon to see small children strapped to inflatable toys and tossed ahead of the crowd in order to claim prime territory. As a parent, it’s not a gamble I’m willing to take with my child. Especially since, as a general rule, it only counts if your child is in an upright position once they skid to a stop. The good news is that once the initial pandemonium is over, things generally settle into a state of peaceful co-existence as, one by one, parents begin passing out while blowing up inflatable toys. Sadly, the evolutionary process has not been able to keep up with the growing demand for larger and larger inflatable animals. Unless you are a pearl diver by trade, chances are your lung capacity is nowhere near what it needs to be in order to fully inflate your child’s favorite water toy. This has created a generation of children who are routinely disappointed by their parents during the formative “spring vacation” years, when parents are trying to build a foundation of trust and respect — something that’s hard to do when your child sees you pass out facedown between the tail fins of a plastic humpback whale. I speak from experience. My son’s favorite water toy is an inflatable “Shamu” that, when fully inflated, can be seen from space. Though I consider myself relatively fit (and by that I mean relative to other people standing in line with me at Burgerville), I have yet, in a single sitting, been able to inflate my son’s whale beyond the point it stops resembling a decomposing whale carcass. That’s about the time dizziness and suspected cerebral hemorrhage forces me to breath pure oxygen — which, fortunately, is now available to parents in single-use canisters at the snack bar. Sure, I’ve tried inflating the whale before driving to the lake. 1) Bring the whale and leave the kids. 2) Stay home and let the kids drive the whale to the lake themselves. 3) Strap the kids to the top of the van and hope for the best. Aerodynamically speaking, the whale would give me better gas mileage. I’m no Boy Scout, but I know how to tie a knot. I stand by that to this day. Just as I did in court, when I argued that it was a single, unexpected 120 mph wind gust — and not defective knot tying — that caused a nine-foot inflatable whale to go tumbling into oncoming traffic. Thankfully, no one was injured, although a family of six on its way back from the local aquarium is still in counseling. 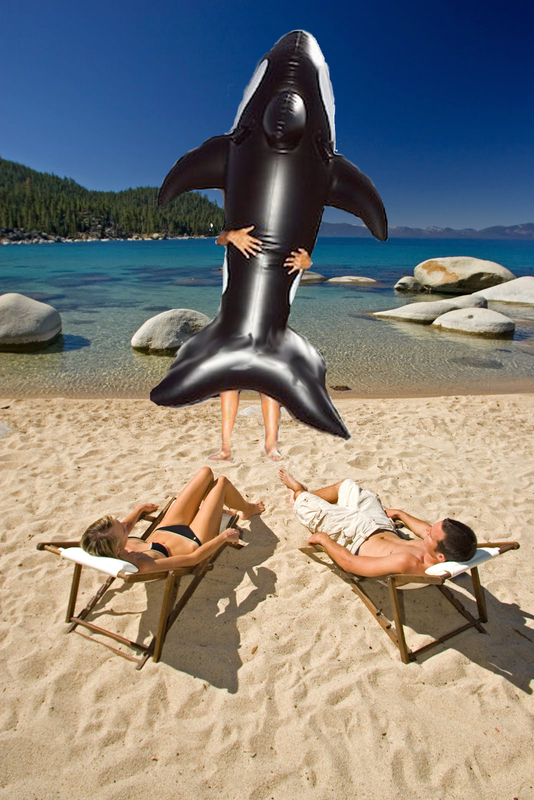 Because of that experience, and a court order, we save the “Shamu” inflation process for the lake. Naturally, the same goes for the deflation process which, in many ways, is even more demoralizing. That’s because in order to get all the air out, I — a grown, 45-year-old man — must roll around on top of a plastic sea mammal while holding onto a tiny air nodule located in a region SOMEONE should have realized was going to look highly inappropriate. Not to mention deplete any respectability I had in the eyes of my children. It’s just part of the rising cost of inflation. Badum-bum! Funny piece. We northern climers suffer the same auto-space conundrum shlepping sliding tubes to the tobogganing hill, with the added lung-busting chore of trying to blow up plastic made semi-rigid from the cold. Fun times. That sounds… uhm… not fun. Especially since, as a Dad, I know I would be schlepping everyone’s stuff because I’m essentially a pack mule with a beard. Only I, and the 70 psychologically damaged men, women and small children at the lake that day know for sure. This makes me laugh so hard… Read several times… Brings tears to my eyes it’s so funny! So glad to hear that. It makes the mental scars easier to deal with. I love when I see a post and the title says it all! Laugh at the title and continue reading if you want to laugh some more was what I read. Some titles write themselves. Others, I pay good money for. Pah. Police just don’t know any better.